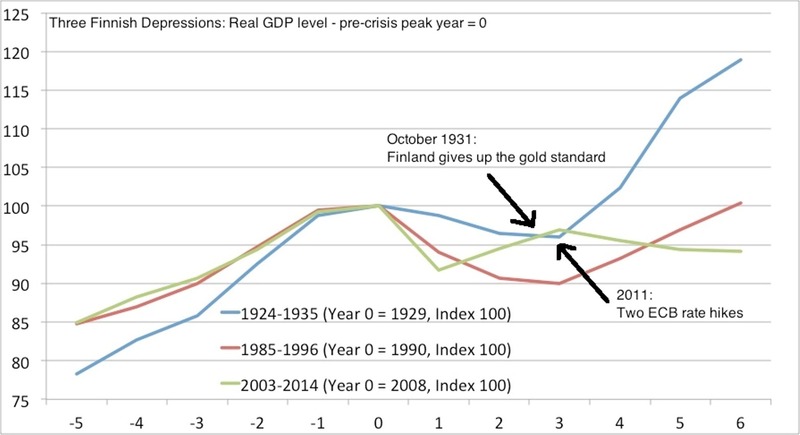 Before Finland adopted the Euro, the common European currency, it faced two severe recessions (or depressions) during its years of independence after 1917. The first was the Great Depression of the 1930s and the second was during the early 1990s (the causes of which included the collapse of the Soviet Union in 1991 and a banking crisis in the Nordic countries). As can be seen from Chart 2, the tight monetary policy of the ECB in the years following the 2007-8 global financial crisis has been accompanied by a very weak recovery in the Finnish economy. In fact, as Christensen notes, the ECB's interest rate hikes in 2011 were followed by a contraction in the Finnish economy after some initial recovery. 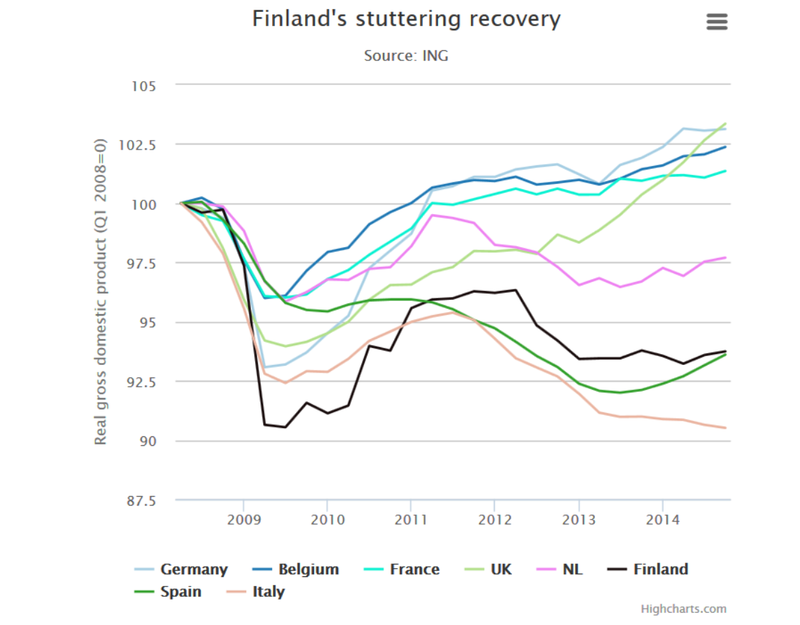 The evidence strongly suggests that Finland needs to devalue its currency to recover from serious recessions. Devaluations boost the country's important export sector, including the forest products industry. As a member of the eurozone, Finland cannot devalue its currency and its monetary policy is set by the European Central Bank. These problems were foreseen in the 1990s by economists and commentators, with Bernard Connolly's book The Rotten Heart of Europe: The Dirty War for Europe's Money being among the most vociferous criticisms. Connolly was fired by the European Commission for criticizing the European Exchange Rate Mechanism, which he used to help run. He saw the Euro as primarily a political project, not an economic one, part of the French and German project of ever-greater political integration in Europe. As Connolly and others warned before the launch of the Euro, small countries situated on the periphery of Europe with economies whose structures differed from Germany and France, would suffer from asymmetric shocks that could not be appropriately dealt with as the small countries would lack an independent monetary and exchange-rate policy. The Finnish economy, for example, relies to a great extent on exports for economic growth. An asymmetric shock is a situation in which a shock to supply or demand differs from one geographic region to another, or when such shocks do not change in tandem. The classic arguments in favour of flexible exchange rates are made by Milton Friedman in "The Case for Flexible Exchange Rates," (in Essays in Positive Economics, The University of Chicago Press, 1953, pp. 157-203) and Robert Mundell in "A Theory of Optimum Currency Areas" [The American Economic Review, Vol. 51, No. 4 (September, 1961), pp. 657-665]. However, later in his career, Robert Mundell offered an argument in favour of a shared European currency. Should Finland leave the eurozone and return to its old national currency, the Markka? In light of my comments, obviously my strong suggestion is that it should, but leaving the eurozone would undoubtedly have various negative consequences, both for Finland and the European Union. Would these negative consequences outweigh the positive effects? The closest we can get to an answer would be by looking at previous exits from currency unions. Rose published a paper studying extensively all exits after WWII. The effect denoted are very small, which leads me to conclude the choice should be made on political, not economical grounds, but everybody is free to have their own answer about this. There is a Government that has the right to collect taxes and conducts fiscal policy, in order to provide some public goods, and also to partially smooth economic inequality through redistribution (not because we are good and humanitarian people, but so as not for the inequality to eventually threaten the SEA's existence). There is the area's fiat money, backed by the Government's sovereignty. There is a Central Bank that makes loans to the Government, so as for monetary policy to be a "negotiated outcome" between the Government and the Central Bank, attempting to partly offset the short-horizon that politicians are forced (or like) to have. The Central Bank has also the role of "lender of last resort" for the commercial banks, so as to secure the stability of the fiat money system. If a SEA-wide shock hits, and an economic recession or crisis sets in, monetary policy can be used in what is in effect a "reverse-causation" scheme: instead of first producing and then creating the money in order to match this new production for exchange purposes, we first create the fiat money, that now functions as windfall-wealth, in order to increase demand and thus generate new production that will eventually match the money (that's what "demand side policy" is all about). If the economy is in a recession, and there is a large amount of unemployed factors of production, it has some good chances of succeeding (i.e. the increased demand will activate again factors of production rather than just create inflation). Note that the use of fiscal policy in such a situation essentially amounts to the same thing -but instead of strengthening the demand of the private sector towards the private sector, it is the government that directly, through fiscal policy, purposefully raises aggregate demand in order to induce supply. If an asymmetric shock hits selectively only some parts of the SEA, then the government can use its tax revenues for (usually geographic, but also sectoral) redistributive purposes, channeling resources to the regions/sectors that are hit. Moreover, if factors of production are mobile enough, they will move towards the comparatively more economically healthy regions/sectors, alleviating the problem of production factors' unemployment, which if it persists, will create a social problem, and will threaten the SEA's cohesion. Now consider the European Union: It has a currency alright, and a Central Bank -but the Central Bank is not permitted to act as a lender of last resort proper -the currently observed "quantitative easing" is a silently accepted bending (not breaking) of the official rules of the ECB. Why deprive the European Central Bank of such a fundamental function of a central bank? Because it was Germany's non-negotiable condition in order to create a common currency, originating from Germany's experience with hyperinflation. Germany did not impose this to others, having made an exception for itself: when there was still a Deutsche mark, Germany's central bank also was not permitted to act as a lender of last resort for the commercial banks (and Germany's economy proved strong enough to not ever come in need of such a safety valve). The EU also has a "Government" (the European Commission) -but its fiscal budget is so small compared to the EU's economy, that it cannot adequately perform any redistributive function to the required degree, in the case of an asymmetric shock (redistribution happens alright -but it is slow and long-term). Also, members' national budgets are under scrutiny and hard-pressed at a political level in order not to go south. Finally, due to history and culture, factors of production, especially human ones, have very low mobility. So while a SEA-wide shock is not really likely for such a diverse area like the EU, asymmetric shocks are much more likely for the very same reasons -and it is for these asymmetric shocks that the EU is really lacking the tools to deal with, at least the tools that are currently known and used. ...We should make a mental effort to imagine what the experience of two devastating World Wars (which are not that old, anyway), has imprinted on this continent. The forced/hurried economic unity/integration represented by the EU, was and still is in my opinion mainly an attempt to lay these continent-wide nightmares to rest. Since this is a "negative" motive, it is only natural that "positive" motives emerged in the process. ...So, perhaps "everyone should exit"? The real issue as I see it is whether the alternative will be eventually along the lines of (economically and/or physically) "sharpening our teeth to each others' neck" -or not. Not the answer you're looking for? Browse other questions tagged macroeconomics monetary-policy currency exchange-rates euro-area or ask your own question. Can banks maintain Euro accounts if the country they're in leaves the eurozone? How would Greece “temporarily” leave the Eurozone? What are the alternatives to currency devaluation? Why would a rise in the discount rate stop foreign gold drain and make banks fail? Is weak global economy always a “headwind”?